In between your hands are a bunch of air molecules, and suddenly hands move towards each other, so space is a lot smaller. You can listen to different frequencies at same time – if you add dif frequency waves together, get weird frequency. Ear has to break this up. Able to do that because sound waves travel different lengths along cochlea. As pressurized wave hits eardrum, it vibrates back and forth, causes these 3 bones to vibrate – malleus, incus, and stapes. Stapes is attached to oval window (aka elliptical window). As it gets pushed, it pushes fluid and causes it to go around cochlea. At tip of cochea, it can only go back, but goes to the round window and pushes it out. Reason doesn’t go back to oval window, is because in middle of cochlea is a membrane – the organ of Corti (includes the basilar membrane and the tectorial membrane). Keeps happening until energy of sound wave is dissipated. Meanwhile hair cells in cochlea are being pushed back and forth and send info to auditory nerve. From pinna to tympanic membrane is the outer/external ear. From malleus to stapes, middle ear. Cochlea and semicircular canals is the inner ear. Stapes – moving back and forth at same frequency as stimulus. It pushes the elliptical window back and forth. 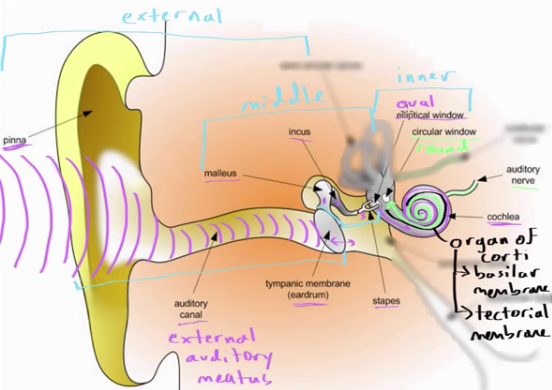 There’s fluid inside the cochlea which gets pushed around cochlea, and comes back around. Organ of Corti splits cochlea into 2. Upper and lower membrane, and little hair cells. As fluid flows around the organ it causes hair cells to move back and forth. The hair bundle is made of little filaments. Each filament is called a kinocilium. Tip of each kinocilium is connected by a tip link. Tip link is attached to gate of K channel, so when get pushed back and forth they stretch and allows K to flow inside the cell. 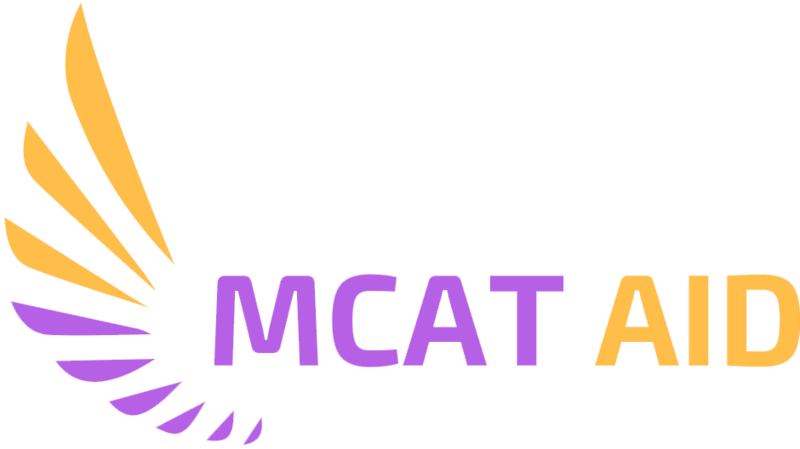 Ca cells get activated when K is inside, so Ca also gets activated, and causes AP in a spiral ganglion cell which then activates the auditory nerve. Brain relies on cochlea to differentiate between 2 different sounds. Base drum has low frequency, whereas bees have high frequency. We can hear between 20-20000Hz. Brain also uses basilar tuning – there are varying hair cells in cochlea. 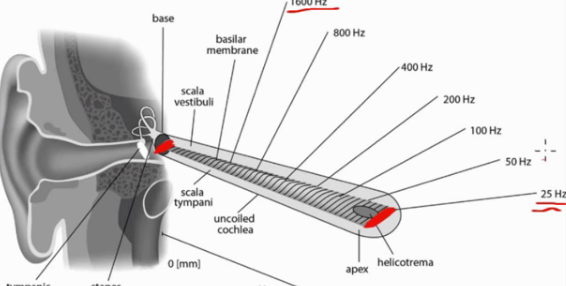 Hair cells at base of cochlea are activated by high frequency sounds, and those at apex by low frequency sounds. Apex = 25 Hz, base = 1600 Hz. Only certain hair cells are activated and send AP to the brain – primary auditory cortex receives all info from cochlea. Primary auditory cortex is also sensitive to various frequencies in dif locations. So with basilar tuning, brain can distinguish dif frequencies – tonotypical mapping. They have a problem with conduction of sound waves from cochlea to brain. 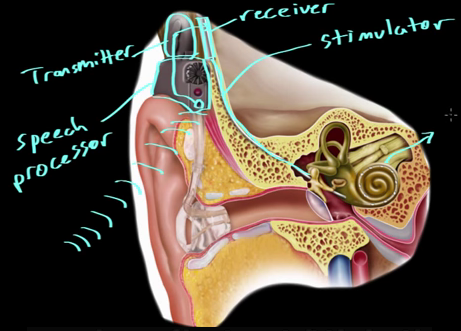 Receiver goes to a stimulator which reaches the cochlea. Receiver receives info from a transmitter. Transmitter gets electrical info from the speech processor. Speech processor gets info from microphone. Sound -> microphone -> transmitter (outside the skull) sends info to the receiver (inside). Then it sends info to the stimulator, into the cochlea, and cochlea converts electrical impulse into neural impulse that goes to brain.